Sleep is important for people of all ages, especially your child. Is he or she getting the rest he or she needs? 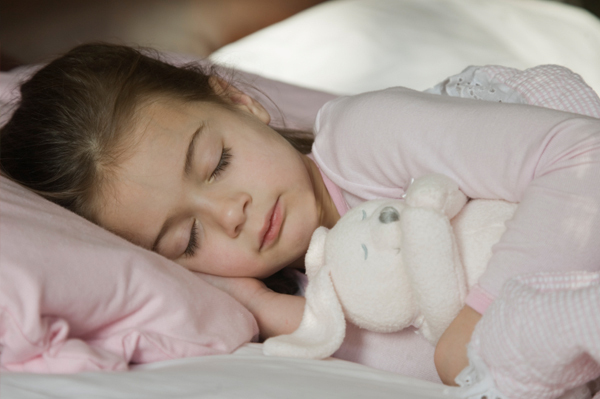 Here are some tips for helping your child get the right amount of sleep each night. Lack of sleep can be detrimental to your child’s heath and development. An average child aged 5 to12 years will require about 10 to 12 hours of sleep. A child that’s sleep-deprived can suffer from mood swings, lack of concentration, clumsiness and behaviour issues. Help develop healthy sleep habits in your child with these ideas. Make your child’s bedroom a warm, cozy environment that will help lull them sleep. Use calming colours such as bubble-gum pink or sky blue on the walls and in the accent pieces. Fit the room with blinds or drapes to darken the room all year round. Make sure your child has a comfortable mattress and pillows. Layering the bed linens will help your child maintain the temperature they prefer. Add a bedside or wall lamp fitted with a low-wattage bulb that can be used before bed, as it won’t flood the room with light. This is also handy for nighttime trips to the washroom. Children love routines — and so do our internal sleep-wake clocks. So, setting a consistent sleep schedule is key to encouraging a proper night’s sleep. Set a regular tuck-in time and a smooth bedtime routine. This will prime your child for an easy transition to sleep. Set a regular time to wake up. Stick to the schedule even on weekends. A bedtime snack can keep your child satisfied before bed and prevent a grumbling tummy in the night, but not all snacks are created equal. Avoid snacks filled with refined sugar. Avoid sugary and caffeinated beverages. Keep your child hydrated throughout the day, and then keep the before-bed drinks to a minimum, to prevent nighttime trips to the bathroom. Provide your child with a healthy, high-carb snack, as carbs have a calming effect. Consider muffins, whole-grain cereal or a sliced apple as snack options. Set up a routine that allows for some quiet activities before bed. Avoid over-stimulation before bed by turning off the TV, computer and video games. Try listening to soothing music, or just enjoy the quietd. Cuddle in and read a story together. Allow independent reading in bed. Have your child take a warm bath before getting ready for bed.